WESTCHESTER COUNTY, N.Y. -- With a new cast of characters on the roster, the Westchester Knicks are back on the court, looking to light up the County Center following their first-ever playoff berth. The Westchester Knicks tipped off training camp this week, led by head coach Mike Miller and General Manager Allan Houston, looking to improve on last season’s 28-22 record that saw the young NBA Development League franchise reach the playoffs for the first time. On Sunday, the Knicks will kick off the preseason schedule against the 87ers before welcoming the Long Island Nets to the Westchester County Center on Wednesday, Nov. 9. They will open up the regular season on Nov. 12 in Delaware. “The D-League is all about change and adapting. You come in knowing that this team is not going to be like last year’s team. There’s different guys and it’s all about who can help us and the club in New York,” Miller said. Sharpshooter Max Hooper, the 16th selection in the NBA D-League draft this year, said that since coming to Westchester, he’s found a profound difference between the professional and amateur game. 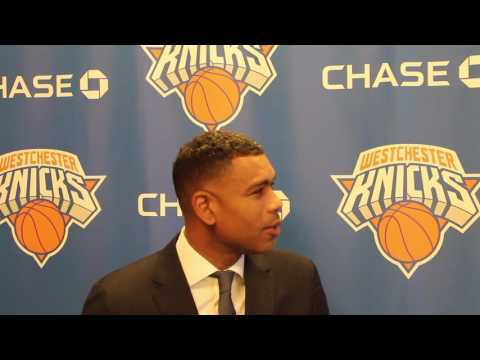 Houston said that while winning with the Westchester Knicks was important, it was vital that the D-League squad and the team in Madison Square Garden stay on the same page as they seek to develop talent through their affiliate. “The community has been great, and everyone at Madison Square Garden has embraced Westchester as an extension of the development process for the Knicks,” he said. “People are becoming more and more aware, not just of the Westchester County Center, but of the experience we offer and the great family environment we provide during games.